I was chatting with a friend of mine about her daughter who is sick. I sure hope she feels better soon and I know how worried she is for her daughter. I don't know what it is lately, but so many people I know are sick or have family members who are struggling with colds and flu (or worse) lately. Wherever you are, I hope you're staying safe, happy and healthy! It got me thinking again though about plants and herbs and wanting to grow a bigger garden again this spring, and how something seemingly so simple could be so healing in a natural and gentle way. I suggested to my friend that she find an herbal store in her area and get some Lemon Balm tea for her daughter. It's one of those soothing plants that when you're sick, if you cannot even keep down water, you'll be able to keep down Lemon Balm tea. One of my favorites, and if my friend were not halfway around the world I'd go out to my yard and snip her some fresh leaves and brew a fresh tea for her now. It's a strange thing the synchronicity of the universe. My thinking about herbs, and being given this beautiful herbalists outfit and hair from Fantavatar & Moonstruck!! Here is the Violante dress in purple and I just LOVE it! I did have to edit the sleeves to be small enough for my avatar since I'm short, but once I got it adjusted I just love how it fits. It comes with two belt options, one plain or this beautifully detailed herbalists belt with pouches, fresh herbs, a little knife, and little scrolls. The dress also comes with a modesty shirt, but I couldn't get mine to rez well for the photo. And the hair... oh the hair!! Fantavatar and Moonstruck is now making hair! The braids and tendrils and wonderful silk ribbon details are color change. I love this style... called Medieval 006. 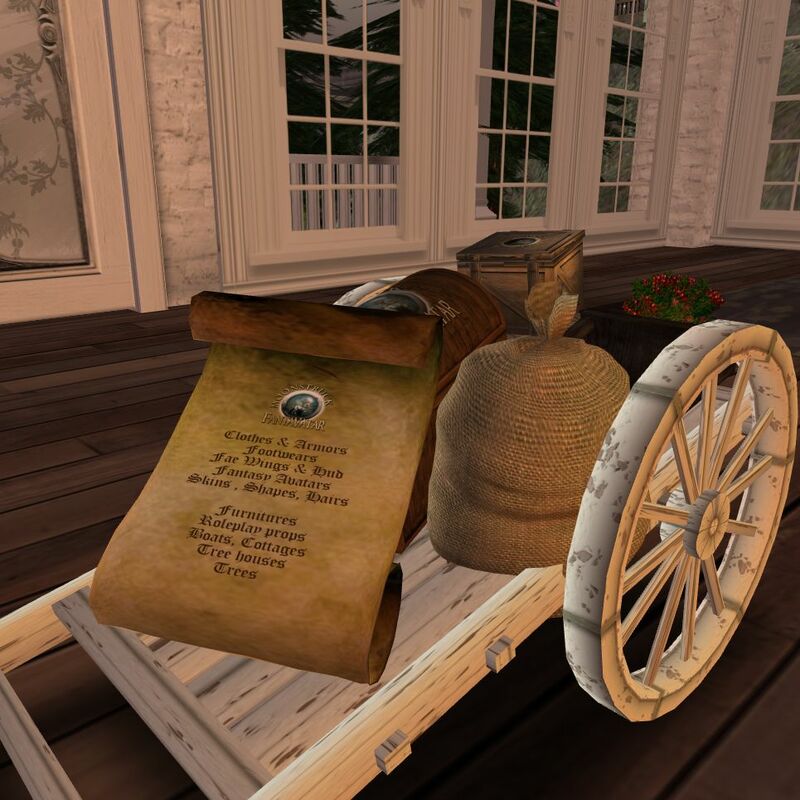 I love the way Fantavatar and Moonstruck send my deliveries in this cute little cart. Just gets me all in the mood to go adventuring. Now.. you may have noticed this beautiful skin I'm wearing. This is Anna2 from Chandelle and I just love it! I will be doing a more in-depth review of this skin soon, so keep an eye out. If you are looking for beautiful and very realistic clothing for Medieval, Renaissance or Fantasy role-play, or if you want beautiful hair for a wedding or other event, please take a visit over to Fantavatar & Moonstruck for some lovely and high quality creations. You can also keep in touch with them on the Fantavatar blog. Good health.. and good fashion to you! Thanks for you compassion sweet Boudica! Daughter is a little better today but cant eat much yet. Skin and bones now!